Title: Metra 605 Pushing Acros CNW Tracks at Western Ave. 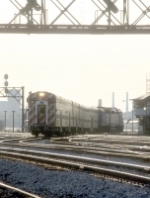 Title: Metra 605 at Western Ave. Description: MILW North Line train #2139 heads past Mayfair Tower. Description: I always wanted to get some pictures of Metra's F40C's. Little did I know that I would get them so close to home...or that they'd be at MidAmerican Railcar. I heard that KCS is going to use these engines somehow.